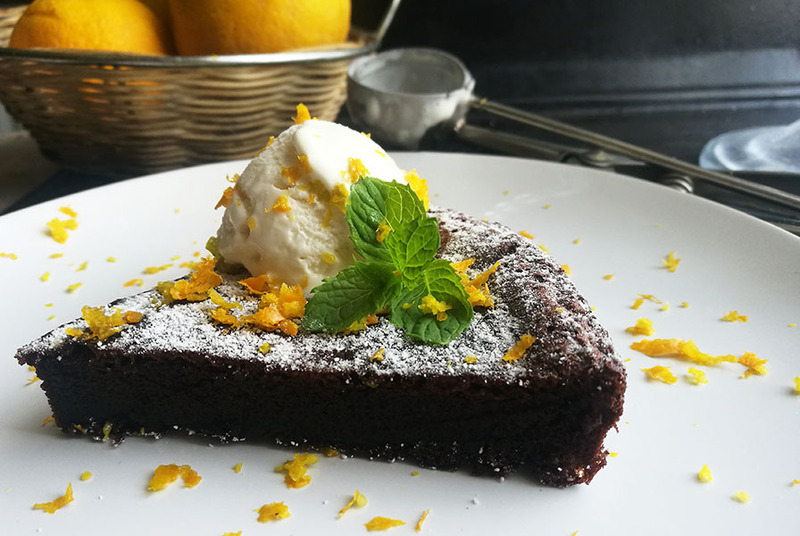 Rich and fudgy, this 3 ingredient Chocolate Orange Cake is pure dessert decadence. Made without flour, oil, or butter, this is one delicious chocolate cake. Every time I bake this cake, it amazes me how just 3 ingredients can create such decadence. Besides the delicious taste and ease of baking, this cake uses minimal ingredients making this one of my easiest and most loved dessert recipe. Chocolate and orange is my all time favorite flavor combination. This is actually the one which I pick out first from a box of chocolates. You know, the dark chocolate with the orange centers, a truly great combination. Now using this combination to flavour this cake creates absolute perfection. 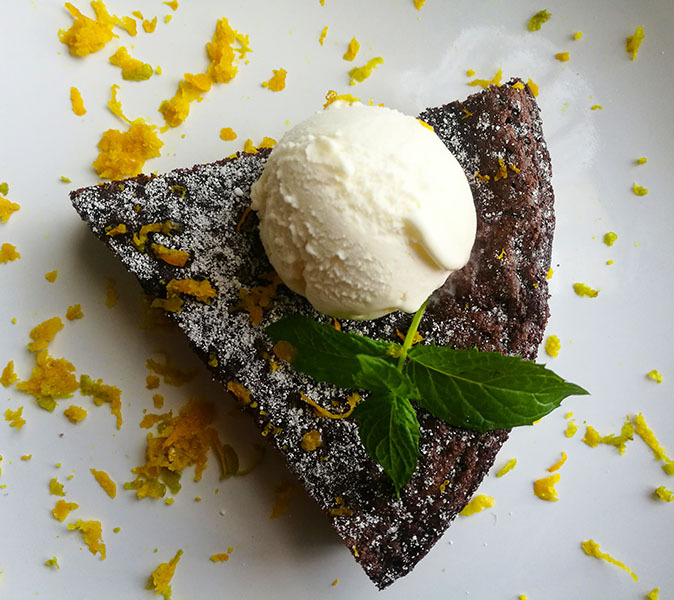 Serve with a dusting of powdered / icing sugar, a scoop of vanilla ice cream or whipped cream and grated orange zest, and you have one impressive dessert. 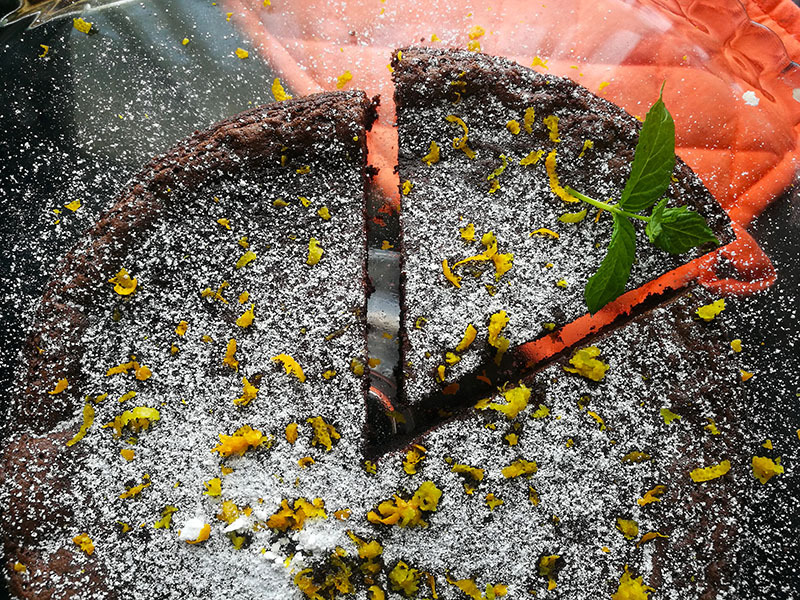 How does this Chocolate Orange Cake taste? 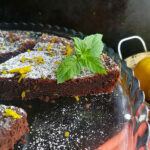 This is a dense fudgy type of cake made with just eggs, chocolate and orange zest. Although there are 4 eggs used in this cake, there is no eggy taste at all. It tastes of rich chocolate and orange. This cake is not overly sweet, so dust a bit of powdered sugar if you want to add a bit of sweetness. This cake is baked in an 8 inch / 20cm round cake pan. The only leavening agent in this cake is the egg. There is no baking powder or baking soda / bicarbonate of soda used. The cake will rise during baking and will deflate or flatten when removed from the oven. This is normal and is usually served as a single layer dessert. Grease and line the base of a 20cm round cake pan. Using a dry microwave safe bowl, melt the chocolate in the microwave until completely melted. About a minute should be fine. Just make sure that the utensils, you are using for the chocolate is completely dry. Water and chocolate do not mix. If the chocolate comes into contact with water, it will cease, making it unusable. Separate the egg yolks and egg whites and using a hand mixer, whisk the whites until soft peaks form and set aside. In the bowl with the melted chocolate, add the yolks, one by one, whisking to combine. At first it may look like the chocolate is separating or drying. Do not worry about this, because as you add the rest of the yolks, it blends well into the chocolate creating a creamy consistency. Mix in the orange zest. Using a rubber spatula or metal spoon, gently fold ⅓ of the whipped egg whites into the yolk and chocolate orange mixture. Repeat with the remaining egg whites, adding ⅓ at a time. Pour the batter in a greased and lined pan. Bake for 20 to 25 minutes in a preheated oven of 320°F / 160°C. Remove from the oven and run a knife or spatula around the edges of the cake to loosen it from the pan. Once the cake is cool to the touch, gently invert it onto a cake stand or serving plate. Dust with powdered / icing sugar and serve with a scoop of ice cream or cream if preferred. So the next time you have a chocolate craving, give this easy recipe a try. A dessert to cure all chocolate cravings, guaranteed. Grease and line the base of an 8 inch / 20cm round cake pan. Using a dry microwave safe bowl, melt the chocolate in the microwave until completely melted. About a minute should be fine.SEE NOTE 1. Separate the egg yolks and egg whites and using a hand mixer, whisk the whites until soft peaks form. Pour the batter in the greased and lined pan. Bake for 20 to 25 minutes in a preheated oven of 320°F /160°C. Dust with powdered / icing sugar and serve with a scoop of ice cream or whipped cream if preferred. 1. Just make sure that the utensils, you are using for the chocolate is completely dry. Water and chocolate do not mix. If the chocolate comes into contact with water, it will cease, making it unusable. Yay for 3 ingredient dishes! Chocolate and orange go SO well together Ashika. This looks amazing! 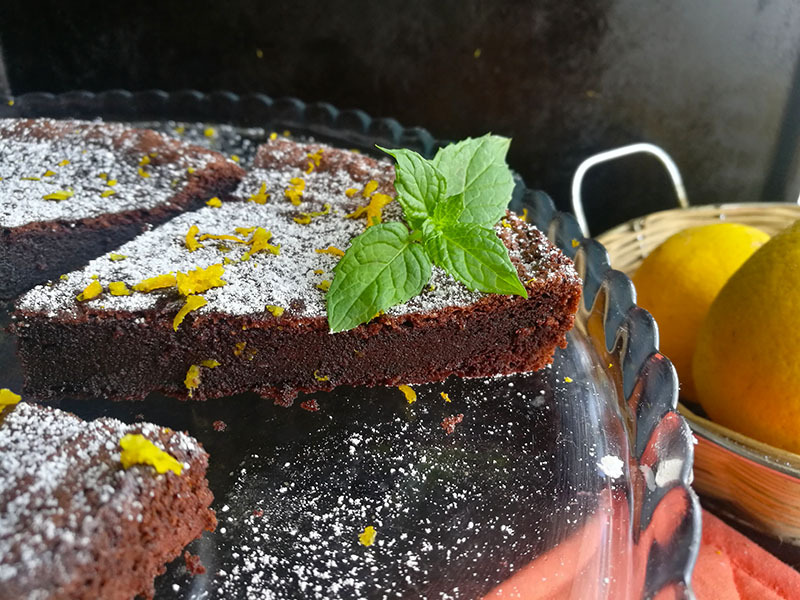 Ashika – I’ve been dreaming of chocolate + orange! I love the fact that you used only Orange Zest here. I imagine the zest provides the perfect amount of orange flavoring – the last chocolate – orange recipe I made had a bit too much orange, so I’m going to give this a try! Thanks so much! Whoa Ashika, this is mind-blowing! Never knew a cake could be made with just eggs and chocolate. Such an amazing recipe, there is no reason not to try this cake. THREE INGREDIENTS? Ashika, you’ve outdone yourself. This sounds fabulous! And dangerously easy :). Have a great weekend, my dear!